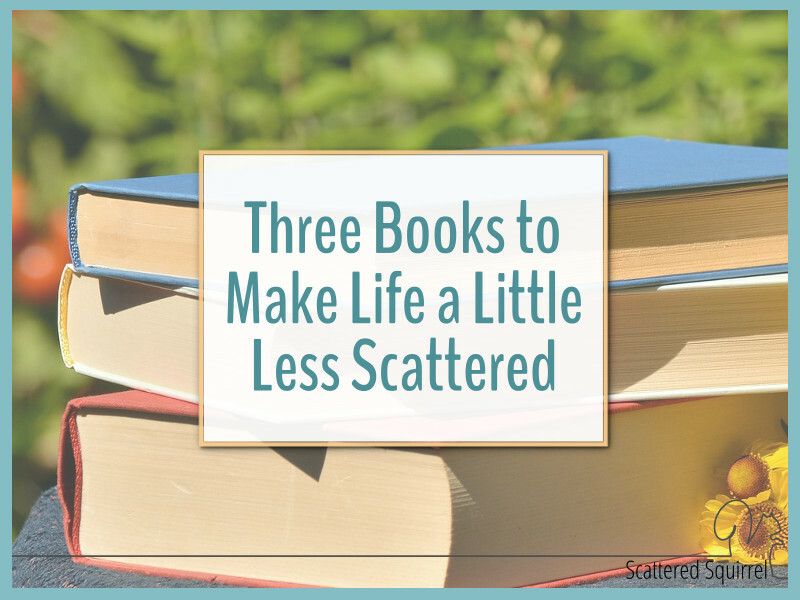 Three Books to Make Life a Little Less Scattered. Do you every find yourself stuck in a rut with not real idea of how to pull yourself out? I know I do. Sometimes it’s because life is in a busy period and I’m just working my three things to keep things running. Other times it’s because something has changed in my normal routine and I’m struggling to figure out how to adjust to it. At times like these I start turning to trusted sources of inspiration to help me climb out and get back to normal. 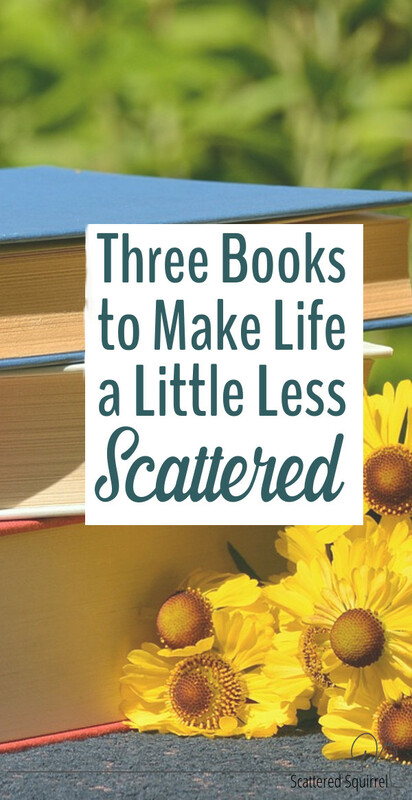 Today I want to share three of those that help me make life a little less scattered. Reading is one my favourite ways to work a little self-care into my daily life. I find it relaxing and enjoyable, no matter what I’m reading. I’m also a re-reader and find myself picking up the same books over and over again. Lately, there are three books that I’ve been thoroughly enjoying. Not just because they’re well written and take mundane topics and make them enjoyable to learn about, but because they’re really resonating with me in this period of my life. These days there are many places to get inspiration for making changes in your life. It’s easy to fall down the rabbit holes of Pinterest, Instagram, and blogs. You start looking for one thing and next thing you know 5 hours have gone by and you haven’t gotten any further along. That’s why I like having a few good books in my library that I can turn to when I don’t want to risk being side-tracked by everything else. I find that reading a book helps me focus better. There is no other visual distraction when I’m reading. No links to follow, just the words on the page and me. The following three books have been in constant rotation in my reading list for the last few months. Each one is helping me in a different way. Time Management Mama has been in my library for a quite a while. It is my go-to book when I’m feeling trapped by all the things I have to do and feel as though I don’t have enough time to do them. The suggestions are actionable and the personal experiences shared in the chapters really help to make it feel more like I’m reading a letter from a friend than a how-to-book. I don’t necessarily follow all the steps or advice, but I find that Time Management Mama is a great starting place. I reviewed this book a couple of years ago, and I still love it. If you’d like to read that review you can find it in the post – What I’ve Been Reading May. Scroll to the bottom of the post to find the review. Both of the authors have blogs/websites that you can check out if you’d like to see more of what they’re up too. Beth Anne is over at Brilliant Business Moms and you can find Sarah over at Small Business Sarah. I really could have used this book years ago! If you’re not familiar with A Slob Comes Clean, you really should check out her site and pod cast. Dana keeps it real. Really real! There are no filters, just the bare truth, and if you struggle with organizing and decluttering like so many of us do, you’ll really enjoy her site. When I heard that she was releasing a book called How to Manage Your Home Without Losing Your Mind I couldn’t wait to get my hands on it. It did not disappoint. I devoured it in one sitting, and am on my third read through right now. Just like on her site, Dana keeps it real. You’ll find actionable steps mixed with fun anecdotes sprinkled with a good dollop of tough love. This book strikes a great balance between being inspirational and motivational. What I truly appreciate is that it is enjoyable to read. Topics like these can make us feel overwhelmed, even when we’re just reading about them, but How to Manage Your Home Without Losing Your Mind is one of those rare gems that is almost soothing to read. You don’t feel alone when you’re in the middle of the book. When it comes to finding inspiration and motivation to tackle cleaning jobs, Melissa Maker from Clean My Space is the woman to go to. I don’t know if it’s her bubbling personalty, her energy, or her passion for cleaning, but I find that after watching her videos I’m always feel more motivated to tackle a cleaning job. When she announced her books was coming out, I couldn’t wait to get my hands on a copy. And I was not disappointed. I’ve only made it through the first few chapters so far. Not because it’s hard to read, but because of how the book is set up. Melissa shares her tips and tricks for making cleaning quick and efficient, and then she breaks down how to use her method’s room by room. I’m really enjoying the Clean My Space. It’s easy to read, leaves you feeling ready to tackle those cleaning jobs, and I adore the fact that while Melissa has a passion for cleaning and cleaning well, she didn’t always love to clean. She created her system from a desire to be able to get the best results in the least amount of time. I can’t argue with that. I am a big believer in finding what works for you. It’s a crucial step to finding balm in the chaos. Part of my system is having a few good books in my library that I can pull out when I need the reminder or the motivation to make some changes. 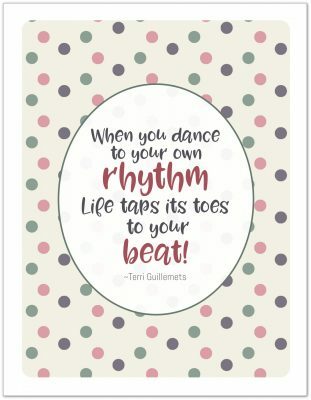 Time Management Mama reminds me to treat my time like the precious commodity it is. Reading through the book and doing the homework is a great jumping off point for reclaiming my time. Once we have an idea of how much time we have to spend on things we figure out what to spend it on. How to Manage You Home Without Losing Your Mind has been a huge eye-opener for me about the way I see (or don’t see) my home. The strategies and tips in the book fit with where I am at right now in my life. I’m slowly implementing the steps into daily life and I’m seeing such a huge difference in how our home is running. The small, actionable tasks are what really help me focus. Clean My Space is changing the way I approach my cleaning jobs. I’m all about doing a cleaning job quickly, but my Mom raised me to also want to do it well. (If I’m going to sweep up crumbs from the corner, I’m going to sweep the whole floor) The techniques and tips in this book check both those boxes. As I head into my spring cleaning I’m going to be going through reach of the room chapters and giving our whole house a fresh clean. Knowing I have a few good resources to turn to when I need a little help focusing on the task at hand, brings me peace of mind. They all help me focus on a different area of my life or my home, and because they’re books and not blog posts, I find it much easier to sustain my focus on the topic, which means I’m less likely to get caught up in squirrely moments. I’m always on the hunt for new titles to check out and I’d love your recommendations. Do you have a book or books that you absolutely love and find to be helpful? Let me know in comments below. This is not a sponsored post. All thoughts and opinions are 100% my own. There are affilaite links in the posts, (see my disclosure policy for more details) but none of the authors asked me to write this. I need to check these out. I’ve watched Clean My Space on YouTube for years, I really want to get the book.